At the beginning of Winter break, we were able to take a trip to Siesta Key, Florida with my family. Our family owns a condo in the area, so we used to go all the time when I was in high school and college. 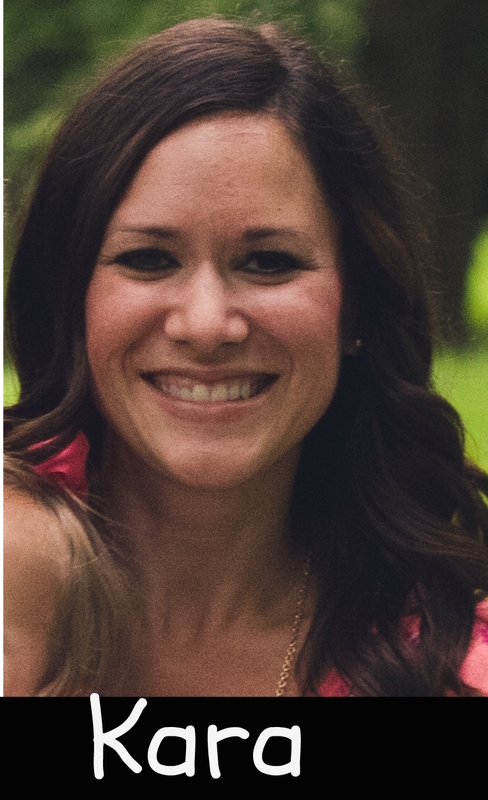 However, with the busy-ness of life with kids, and a med student husband whose time is not his own, we have only been there once since Kinsie was born, and she was a baby so she didn’t remember. My parents and my sister’s family flew in a few days before we did, because I had to finish my last few days of school before Winter Break started, and Ryan had another residency interview trip to return from. In those days, we had a major ice storm in Indiana, which delayed and cancelled many flights…ours being one of them. We ended up flying the next day straight to Orlando – which really worked out better for us because we were planning on spending that afternoon and evening at the Magic Kindom for Mickey’s Very Merry Christmas Party anyway before spending the rest of our vacation in Siesta Key. 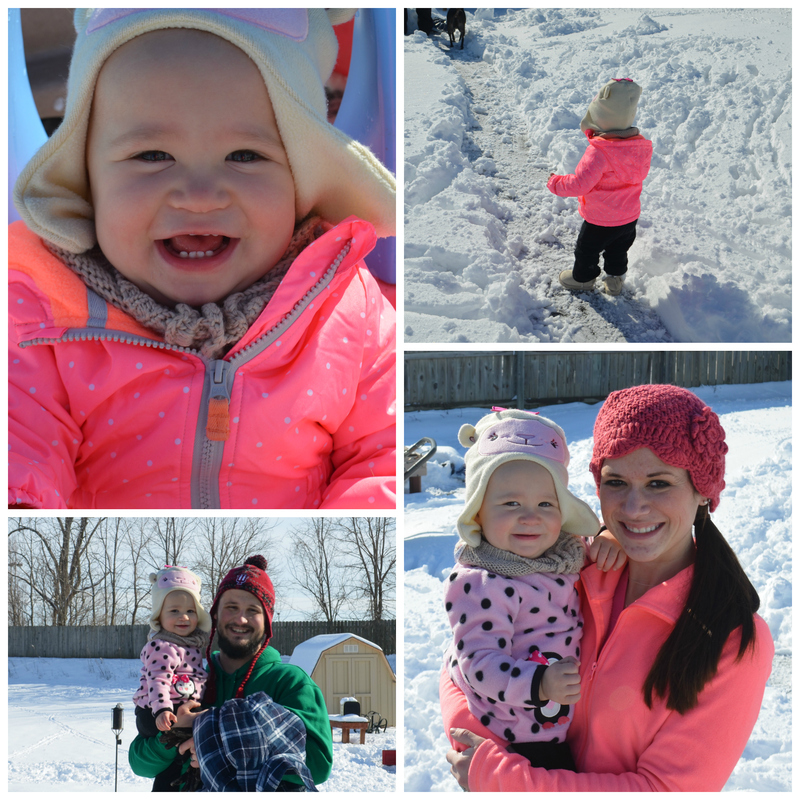 We were all THRILLED to get away from the freezing cold weather! This was our first time traveling with 2 kids. While the kids were absolute champs, traveling with two is quite different than just one! 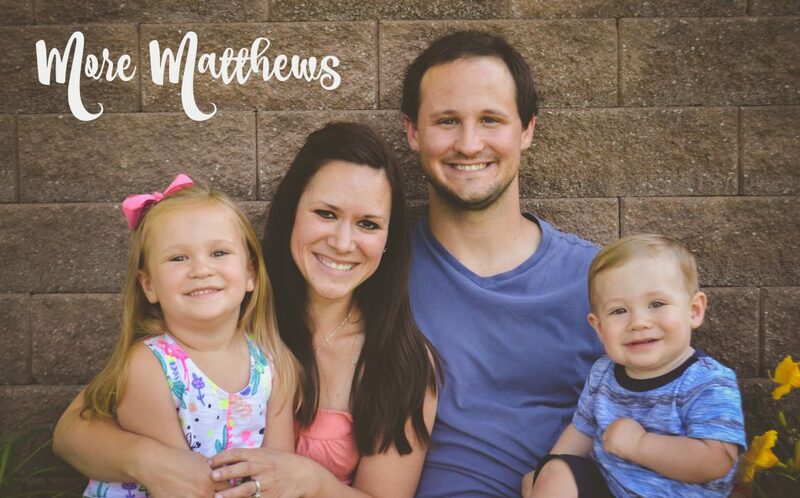 Our time at the airport was complete chaos with all of our luggage including 2 car seats, wrangling the two kids, trying to prevent Brax from spitting up all over the airport seats while trying not to spill our coffee on ourselves, the kids, or even the floor (can’t waste that gold!) Kinsie was excited to roll her own suitcase through the airport. She spent the flight singing Christmas songs to everyone and watching episodes of Mickey Mouse Clubhouse, and Brax slept the majority of the flight. During the time he was awake, he was happy but crazy (per usual!) He made loud happy squeals, smiled at everyone around him, and squirmed so much that we were sweating by the end of the flight. Like I said…the trip wasn’t bad, just chaotic! Once we flew into Orlando, my parents picked us up and we headed straight to Disney World. We didn’t buy regular admission tickets, just for the Christmas Party…so we were able to enter the park at 4pm. As soon as we got there, the first thing we did was meet Mickey. Brax was beyond tired at this point, so he really needed to nap, but I really wanted him to get to meet Mickey. He LOVED him! Kinsie and the other kids of course loved him too! During our time at Magic Kingdom, we rode a few rides, watched the parade and the fireworks (our favorite parts), ate Christmas cookies, and had a dance party with the reindeer! We were there until after midnight, and Brax slept on and off in the stroller, and Kinsie not only stayed awake the entire time we were there, but walked the entire time! 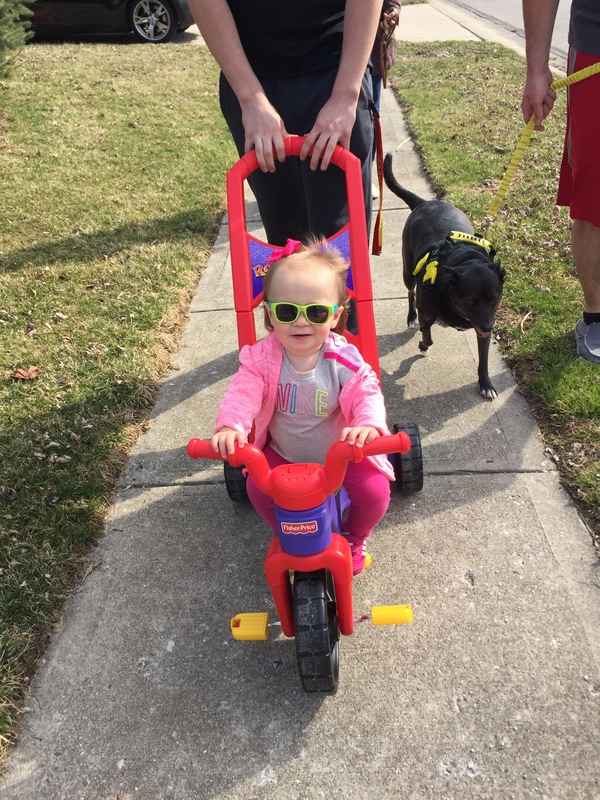 Even when we held Brax and offered the stroller to Kinsie, she wanted to walk. Finally as we were leaving the park after midnight, Kinsie passed out in Ryan’s arms. We drove back to Siesta Key that night and arrived at 3am. It was a long, exhaustic, but wonderful evening! 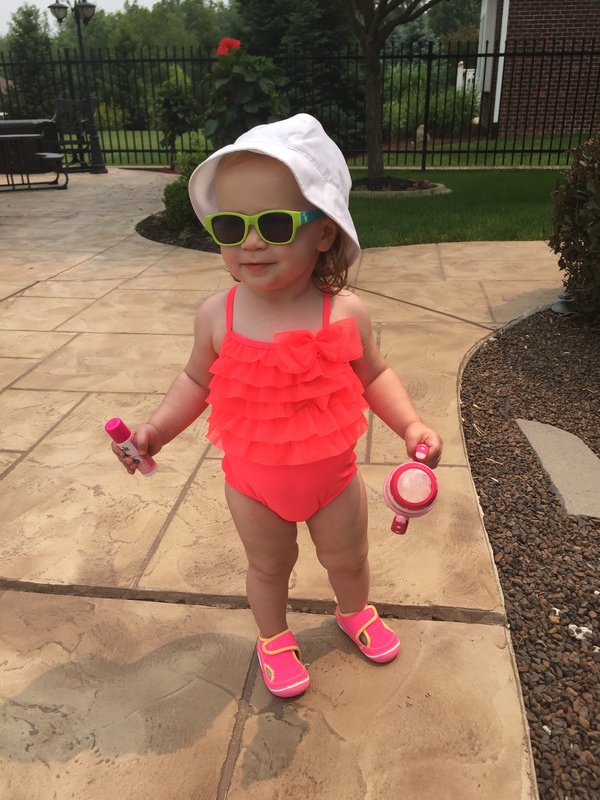 Kinsie was only 9 months old when we went to Siesta Key last, and while she loved the pool and the sunshine, she was not the biggest fan of the beach – mainly because she was too little to run around and enjoy it. The closest we have come to the beach since then was last summer when we went to the Dunes for a family reunion. Kinsie loved that beach, so I figured she would be in heaven on Siesta Key Beach…one of the world’s best and most beautiful beaches. Boy, was I right! She spent all-day every day at the beach. Ryan and I took turns in the condo with Brax for his naps, but Kinsie always stayed on the beach either with one of us, or with my parents. 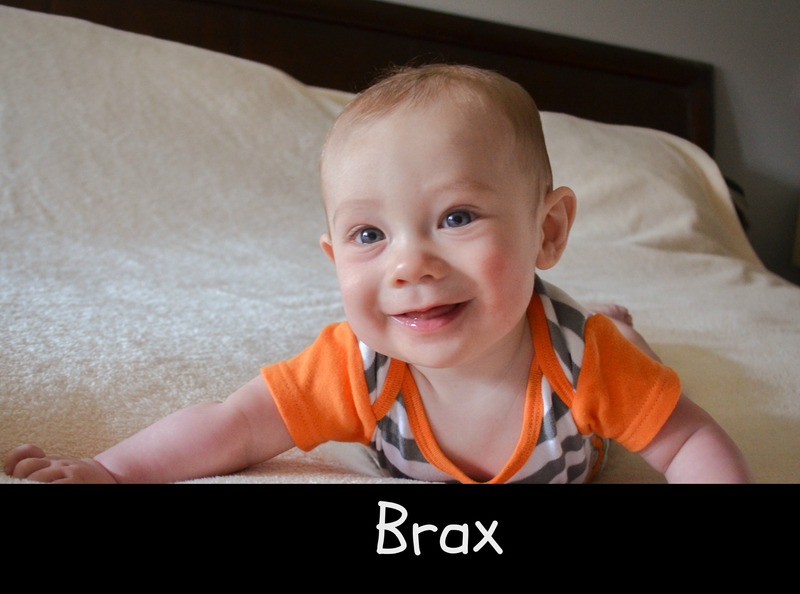 Brax obviously couldn’t enjoy it as much as Kinsie, but that kid has fun doing just about anything. He enjoyed it the best he could! 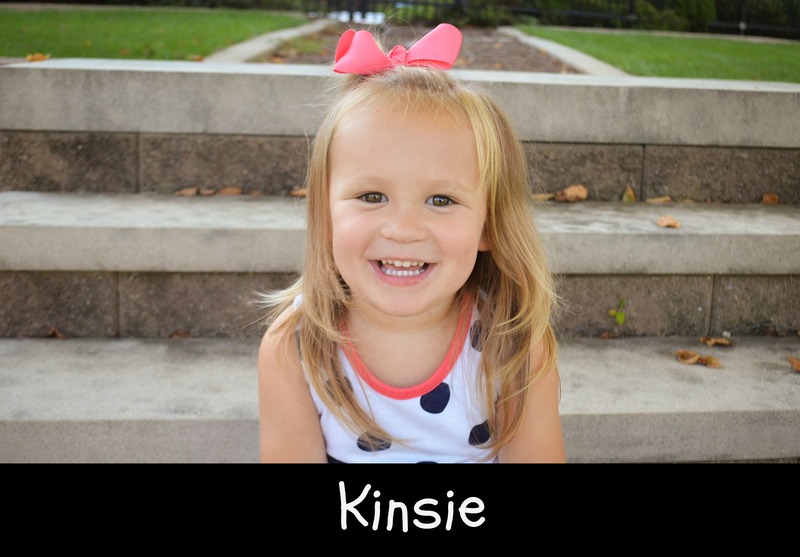 Kinsie loved spending time with her cousins. They spent a ton of time playing in the ocean, finding sea shells and seaweed, chasing seagulls, and making sand castles (and sand hippos too). We were there on my mom’s birthday, so we had a cookout on the beach on that day. Brax ended up coming down with an upper respiratory infection while we were there, so he was a bit needier than usual, but he still did very well considering. Ryan and I really wanted to get the chance to go fishing on the dock, but it was difficult to find the time. We tried to go during Brax’s naps, but he didn’t sleep more than 45 minutes at a time since he didn’t feel good. On the last night of our trip, we were able to make it happen once the kids were in bed. We didn’t get many bites that night, so we went back with the kids the next day before going to the airport. Ryan finally caught a snapper, so we were excited that we at least got something during the trip! We all had such a great time. The weather was perfect while we were there, making it hard to come back to Indiana. We can’t wait to go back again! Well, I hate to say it but this was my last official day of summer vacation. It is uncanny how quickly these summers go by now that we are on the balanced calendar. Eight weeks for a summer vacation just isn’t long enough! But then again I am very grateful to even have a job where I can have this much time off. 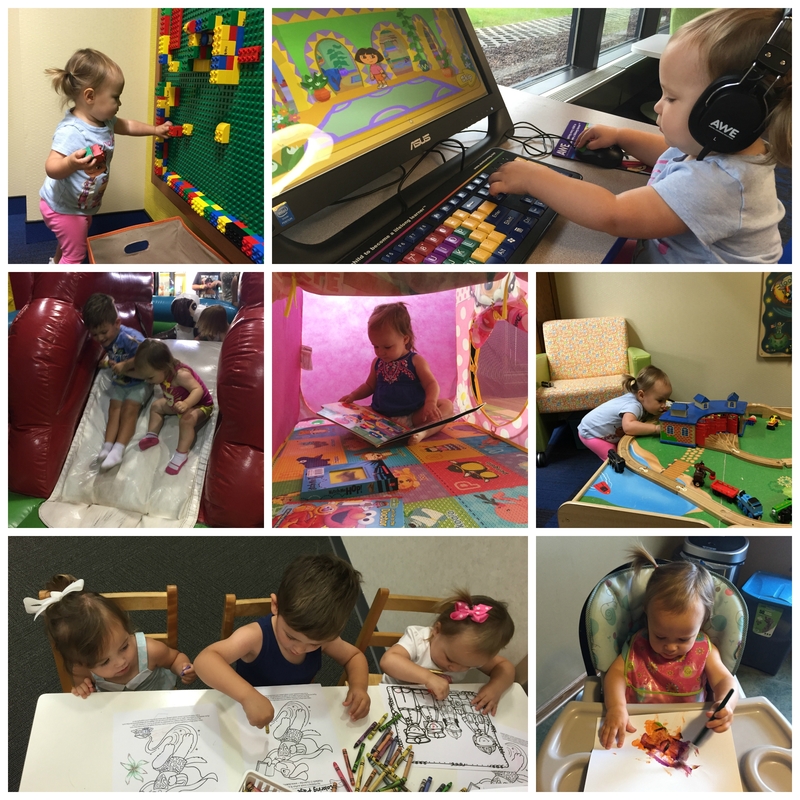 I haven’t posted much the last few months, so here is a recap of our summer. 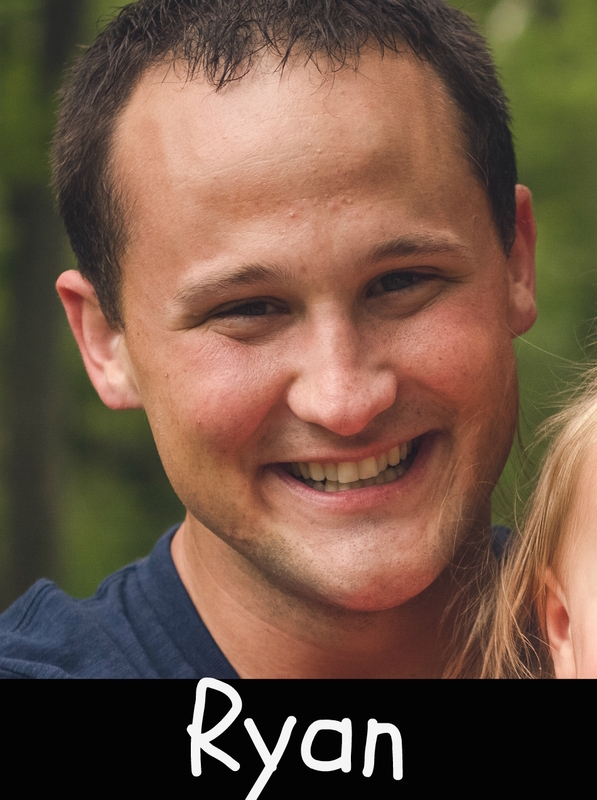 Ryan took his STEP 1 Boards in early June, then started his clinical rotations a few days later. 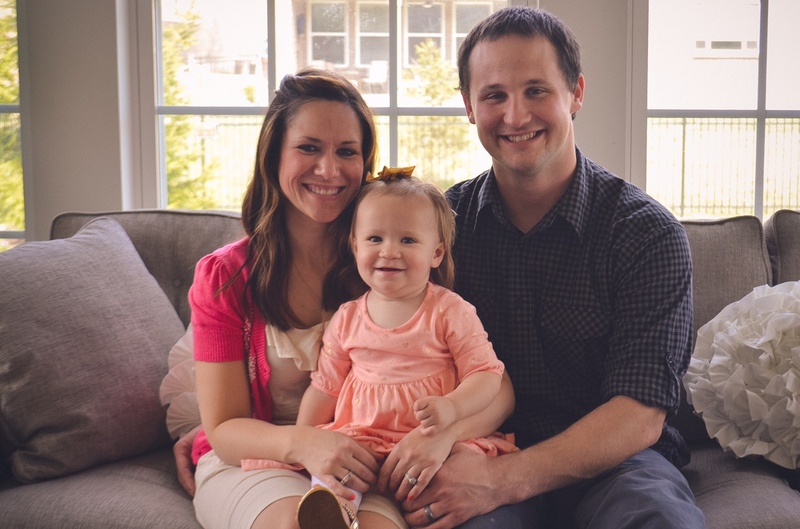 His first rotation was in OB/Gyn…which is notorious for being one of the most intense rotations. This rotation included 13 hour days, 6 days a week (and keep in mind he isn’t even getting paid!) He would barely get home in time to see Kinsie before she went to bed. Because of this, he learned pretty quickly that this is not the field of medicine for him. After this, he got to experience the other end of the spectrum, Anesthesia. During this 2 week rotation, he only worked 40 hour weeks with weekends off. It was glorious! 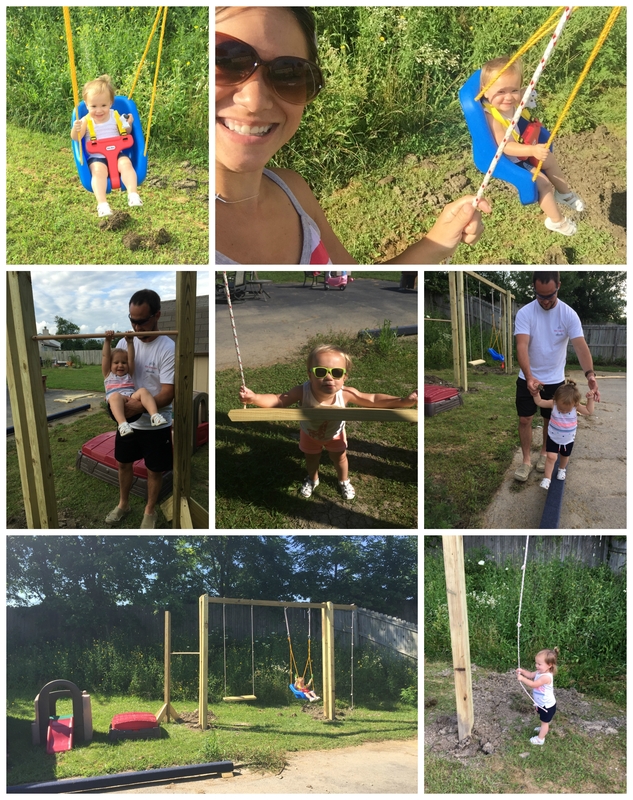 We got in SO much quality time with him during these 2 weeks, and he even had time to build Kinsie her very own swing set in the backyard! Being able to spend time with his family is obviously a priority for him, so anesthesia is not off the table! Today he started Plastic surgery which I’m sure will be an adventure! It is still taking some getting used to having him home every night…in a good way. Sometimes I just forget that he is coming home at night! One of the hardest parts about when he lived in Muncie was at night after Kinsie went to bed. It’s definitely no fun going to bed alone every night. But now we’re enjoying our time snuggling on the couch and watching Orange is the New Black while eating popcorn. It is SO good to have him home! 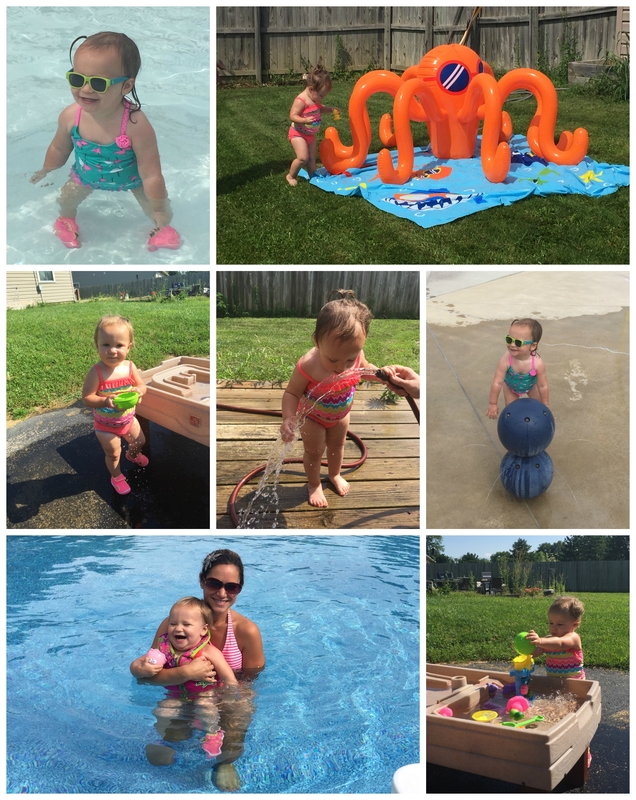 This summer in Indiana was actually a bit depressing…probably 80% of our days were rainy and muggy. 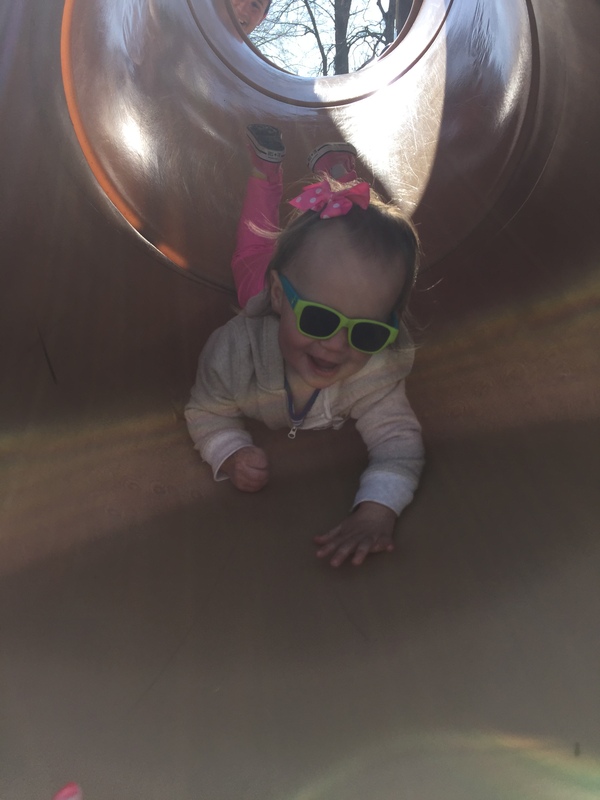 Not only is this depressing for someone who loves the sunshine, but it’s especially so for a toddler who loves the sunshine and has a ton of energy! I had to be very creative coming up with indoor activities for us to do on the many days we couldn’t go outside. We took trips to public libraries, did arts and crafts, read a lot of books, and watched a lot of movies! Well…I shouldn’t say a lot of movies. We watched the same movies over and over again. Her new obsession is Shrek, so we watched the 4 Shrek movies and the Shrek musical pretty much on loop! 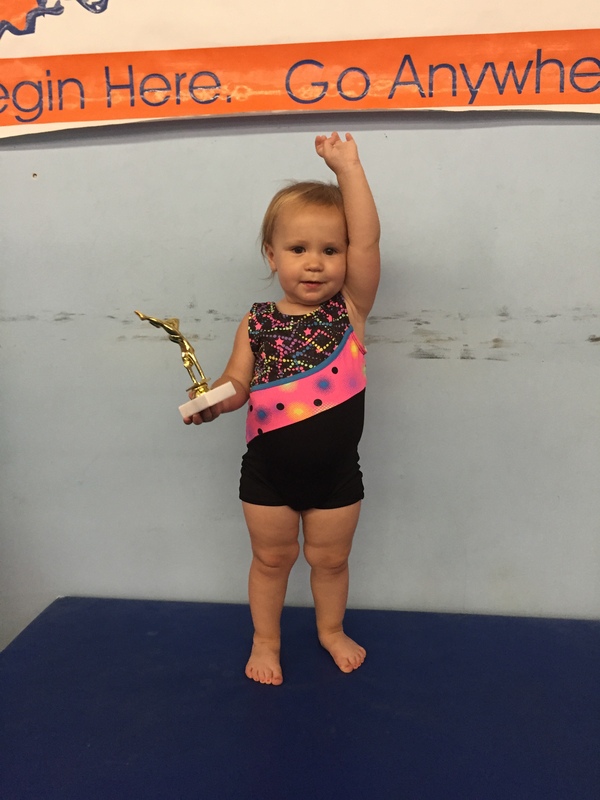 Kinsie started gymnastics classes this summer! She had been climbing on everything and tumbling around nonstop, so we figured this would be a good thing for her. She absolutely LOVES it! 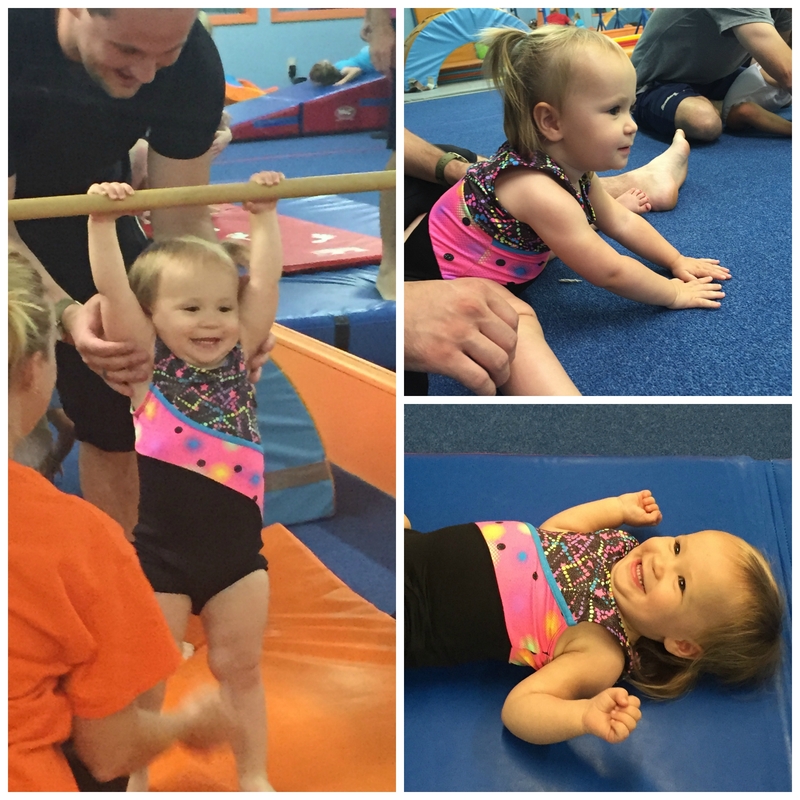 Her favorite thing to do is somersaults, but she also loves the balance beam and the bars. She even got her first trophy last week! We had a busy 4th of July. 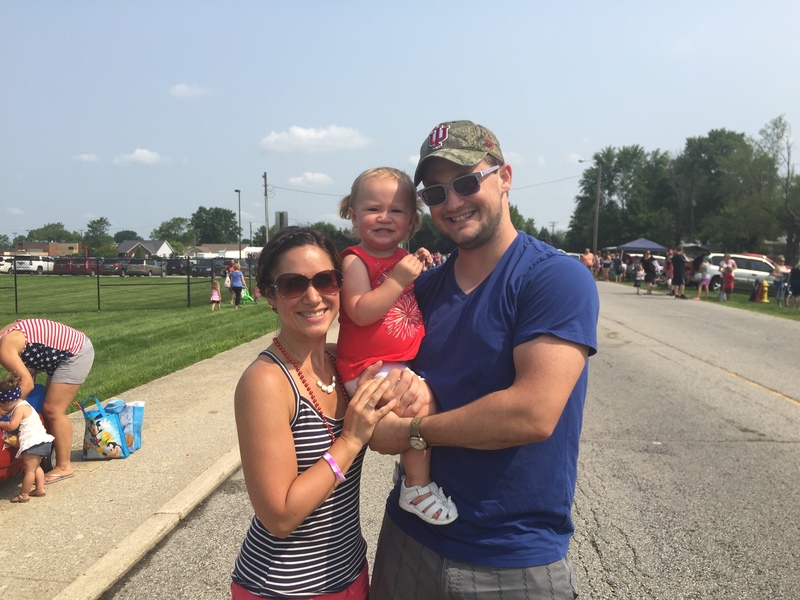 First we went to the Brownsburg parade. Kinsie, Briggs and Kerigan were all about collecting the candy thrown by the floats. They were proud of their big bad of candy at the end! Later we went to the lake, like we do every year. Kinsie had fun playing with cousins, doing sparklers, and watching fireworks on the boat. 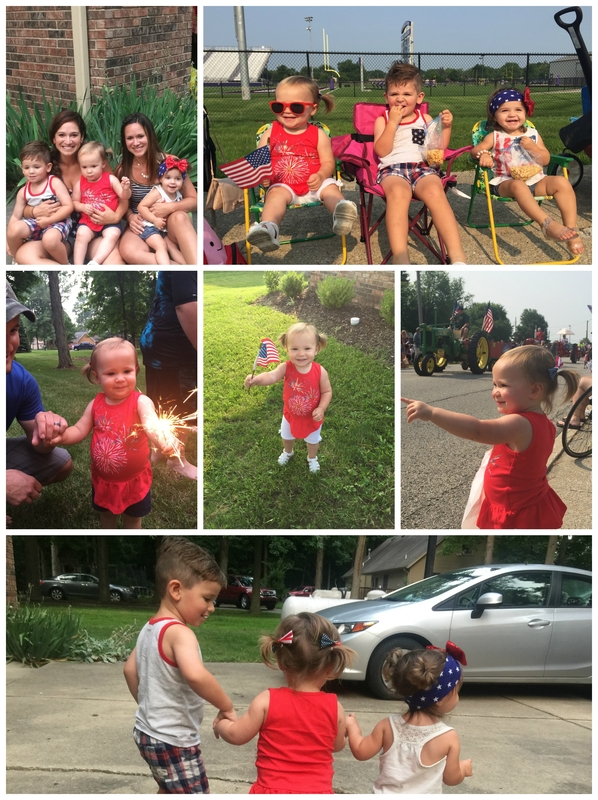 Last year she wasn’t able to stay up late enough to watch the fireworks, but we made sure she did this year! 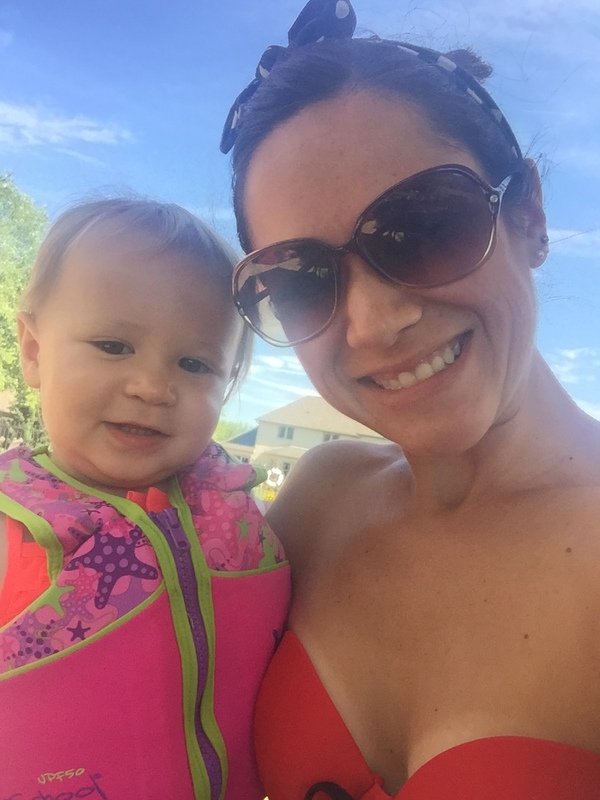 Two of our favorite places to hang out this summer were the zoo and the lake. 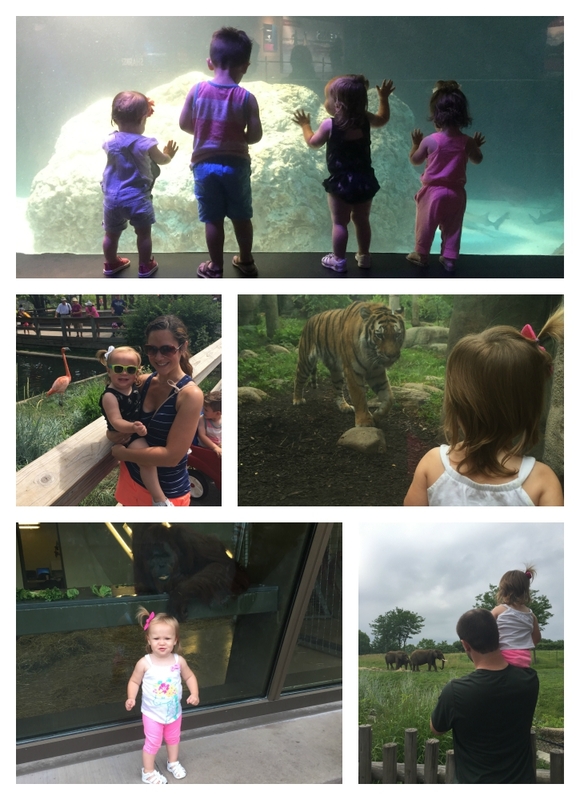 You all already knew that Kinsie was obsessed with the zoo and animals in general, so of course we tried to find as many not-rainy, not-too-humid days to spend at the zoo. She especially loves it when we meet her cousins there! The lake, however, is a new obsession. We can’t even mention the word “lake” unless we are driving there. For a while, every time we got in the car, she would say “lake?” and when I’d say no, she would pout. When we say her prayers at night, she prays for the lake. When I ask her in the morning what she dreamed about, she says the lake. The lake is her happy place. 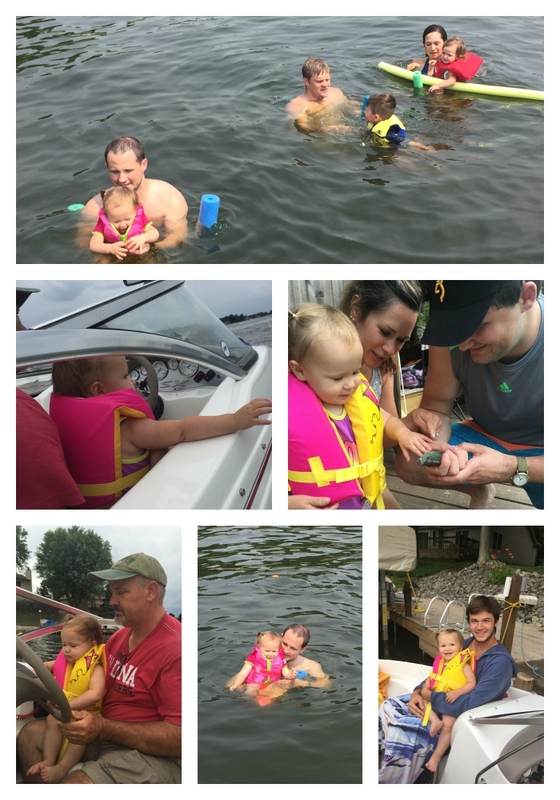 She loves the boat, the toys, the fishing,…everything. We made as many trips there as we could this summer, and will continue to make weekend trips when we can even though school is starting. I don’t blame her, I love it there too! Even though sunny days this summer were few and far between, whenever it was nice enough, we were outside. Wagon rides, trips to the park, swimming at my parents’ pool, you name it. God must have been looking out for us, because our last full week of summer was BEAUTIFUL! I had one very happy girl! To add on to that, like I mentioned earlier, Ryan built a swing set in our backyard…complete with 2 swings (a Kinsie swing and a “mommy swing” as she calls it), a climbing rope, a bar for gymnastics, and even a balance beam. Kinsie was on Cloud 9! Every morning as soon as I opened her door, she’d ask to go swing. I didn’t mind because I could swing right along side of her! 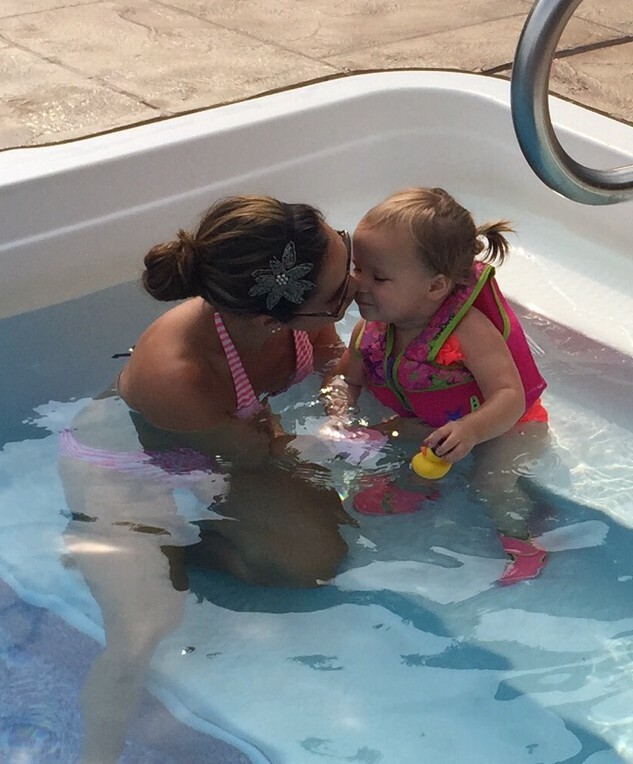 Some of the water fun we had this summer! 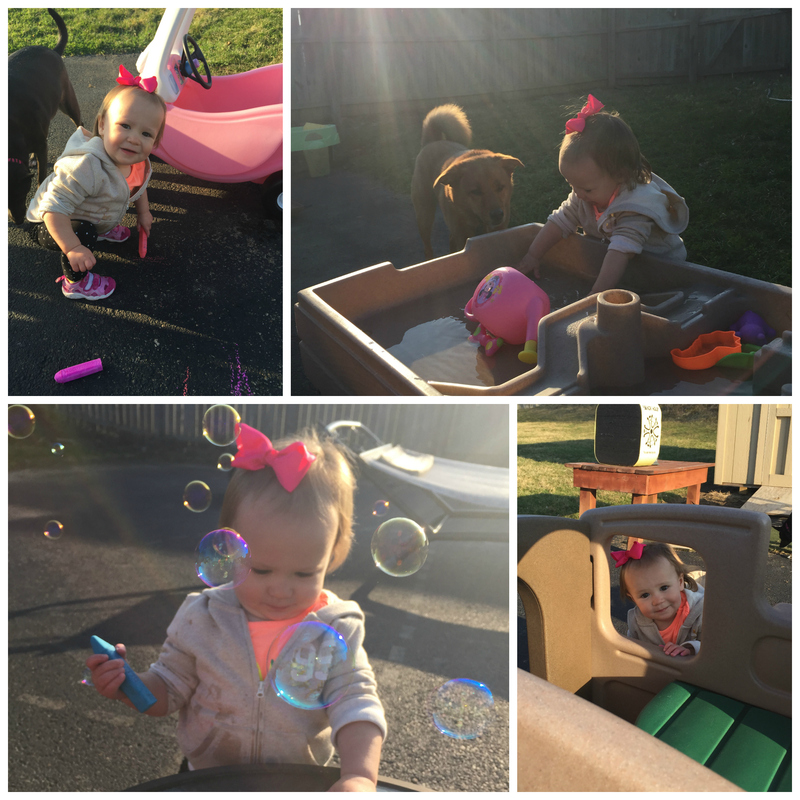 Parks, wagon rides, and bubbles. Kinsie’s new swing set. Kudos to Ryan for the excellent craftsmanship! 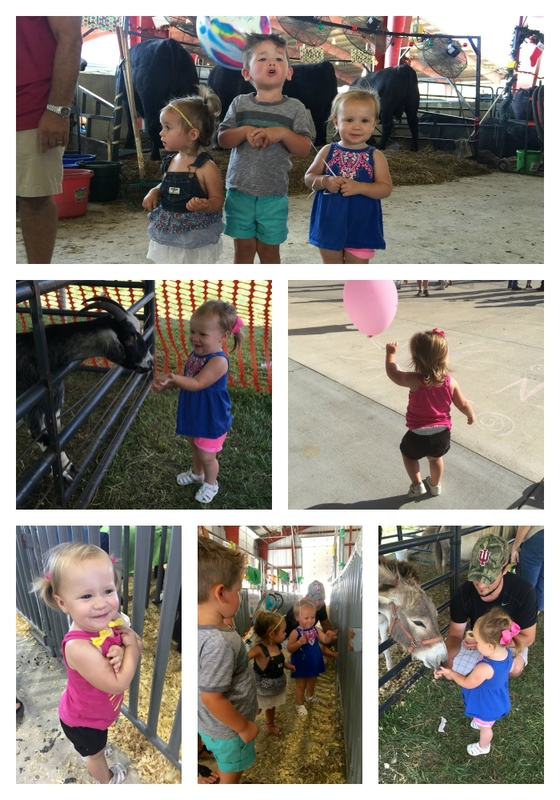 Finally, the last full week of summer was also the week of our county fair. I love going to the fair for the good food and to see my students with their 4H projects. Kinsie loves the fair for the animals and balloons. We went twice during the week, and both times she was one happy camper. She wouldn’t stop talking about balloons until we got her one, but once she did, she strutted around like she owned the place with her balloon in hand. She loved the “hop hops” and the goats, especially when they licked her hands. I love how much she loves life! I’m sure you can tell that overall, we had a pretty good summer! I am so grateful for all the quality time that I got to spend with my girl. Her newest thing is always wanting to hold my hand. No complaining here! 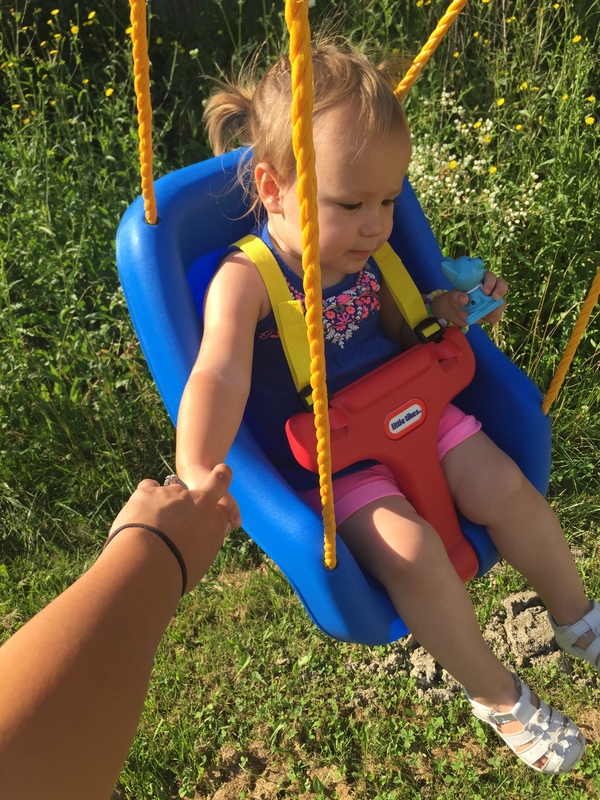 I know that she won’t always want to hold my hand as she gets older, so I’m savoring these special moments. I’m not ready to be away from her all day again, even though I know she’ll be in the best hands. 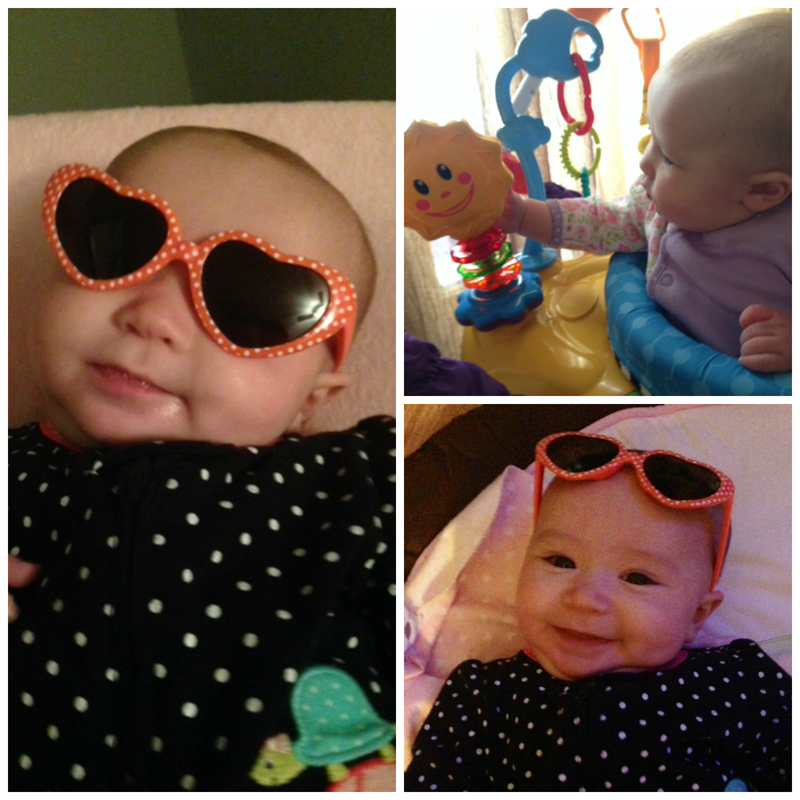 She is just too much fun and so full of life. She has changed my life in so many ways and has taught me to live in the moment and just enjoy life. Thank you, my sweet baby girl. I love you more than I can ever explain! Here’s to the start of a new school year! I am so excited that it is finally SPRING!!! 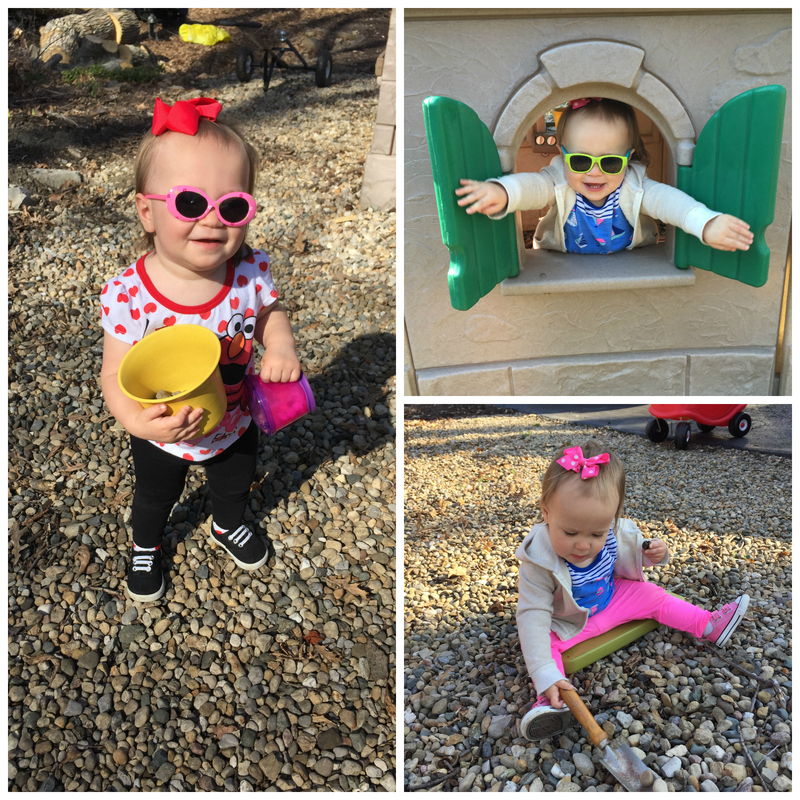 While this past winter wasn’t near as bad as last year, it is always so refreshing to be done with the cold, dreary winter in Indiana…especially when you have a crazy toddler and a very small house! We took her out to play in the snow one day, and she was less than thrilled. She didn’t mind sitting in her little car, or when we held her, but she wasn’t crazy about playing or even standing in the snow. She’s definitely my child! Kinsie has been pumped about the fact that we can go outside and play now. She makes sure I take her out every possible chance we get. I had a 2-week spring break, which is always much needed. The first week was cold and rainy, so Kinsie and I had to get creative on how to spend our days. We spent a few days in Muncie with Ryan, went shopping, and watched “Pups” (101 Dalmatians) a few more hundred times. Even when it was raining, she was always looking out the window telling me she wanted to go “outhide,” or go “wee” (swing). So of course as soon as the rain stopped and the temperatures broke 50 degrees, we were outside and she was in heaven. We have a great fenced-in backyard with lots of stuff to entertain her. 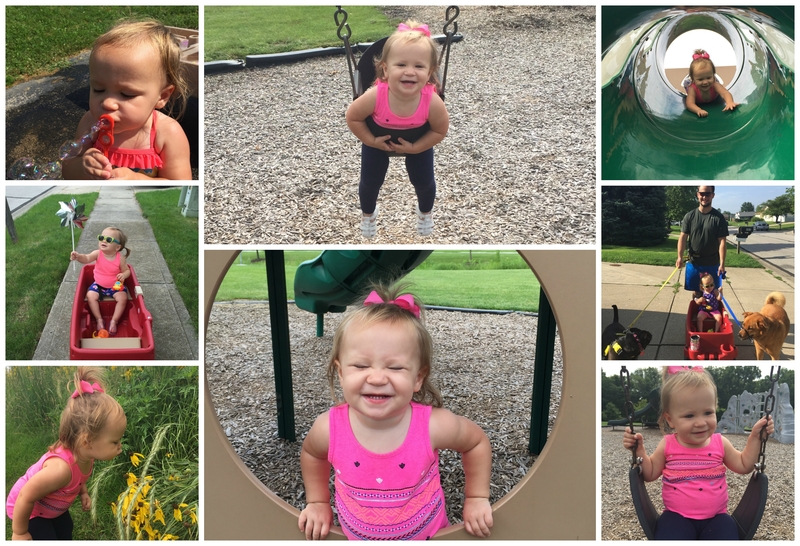 She loves sidewalk chalk, bubbles, her water table, and finding leaves, rocks, sticks, and worms! Yes, this girl likes to make friends with worms. Kinsie is obsessed with going to the playground. She loves to swing and go down the slide. Her newest thing is going down the slide head first. Of course we are always waiting at the bottom to catch her though! 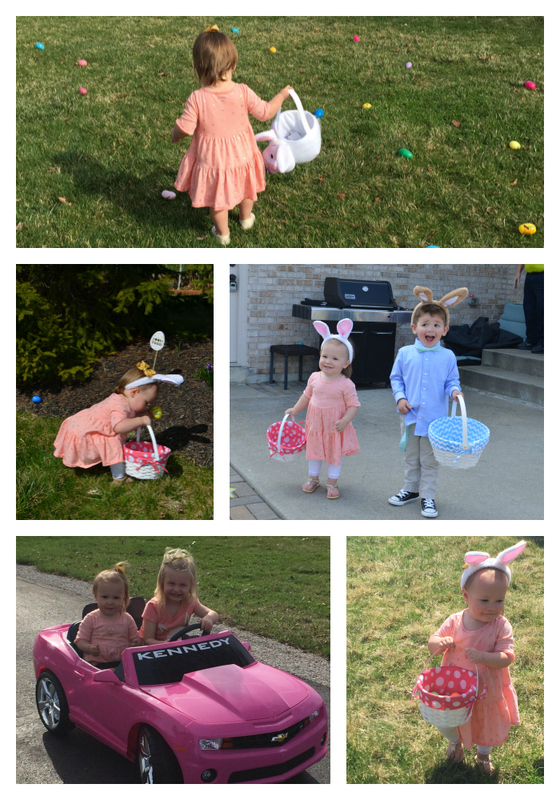 We also had a very busy and beautiful Easter weekend. Kinsie is getting to the age where she understands so much more and is so much fun during holidays. 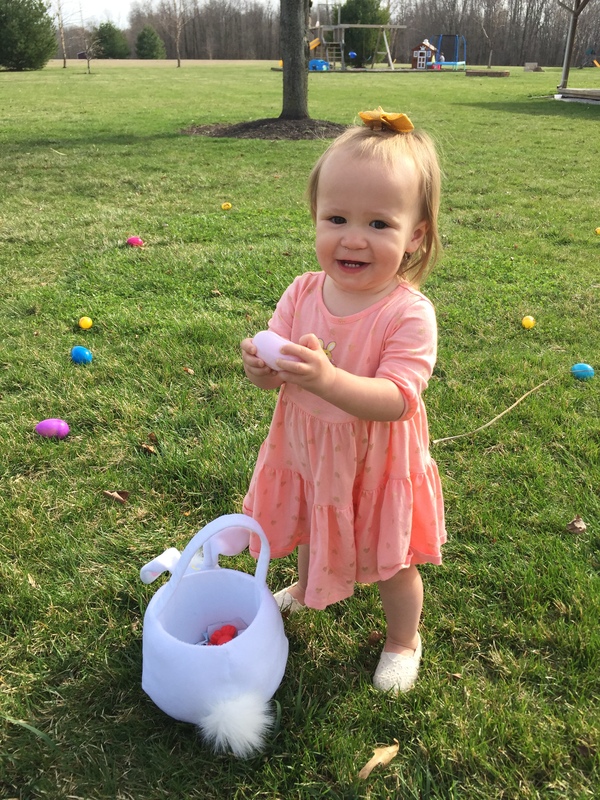 She was really into all the eggs and bunnies (she calls them “hop hops”). While we were in Muncie, we went to the mall and I’ve always thought the Easter bunny was kinda creepy, but she saw it and loved it! She kept yelling “hop hop!” and laughed when it waved to her. On Easter Sunday, we went to church and heard another amazing service with 138 baptisms over the entire weekend! After church we had brunch and an Easter egg hunt at my sister’s house. 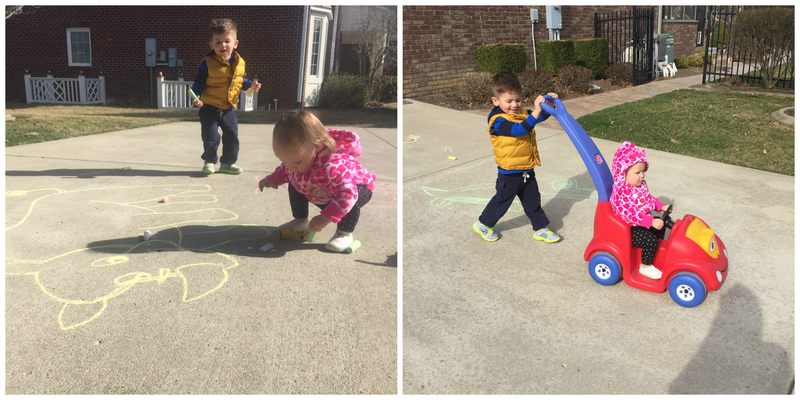 The kids LOVED their Easter egg hunt! Kinsie literally could have done this all day. After Kinsie’s nap, we went to Ryan’s aunt’s house where she got to do another Easter egg hunt and play with some of her cousins. Finally, we went to my parents house for dinner. Since the kids had so much fun with their egg hunt earlier, we had another one for them so they were pretty excited! Easter is such a special day to me because it is a reminder of the amazing grace that Jesus has for us. 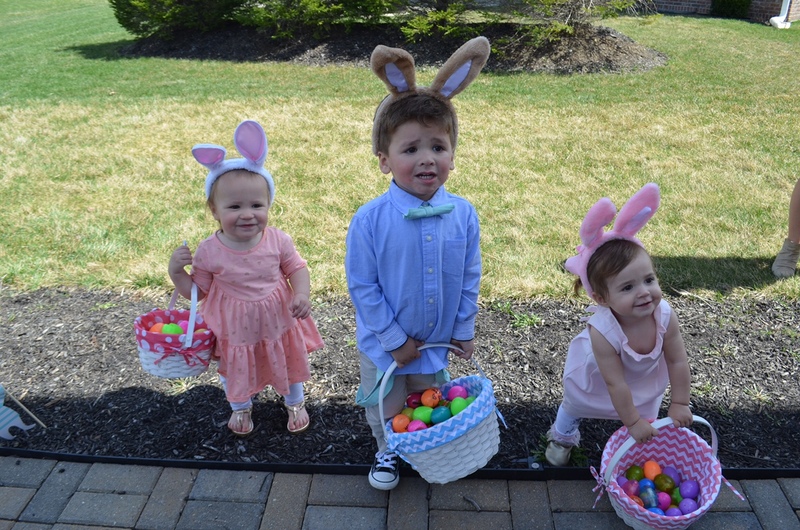 It is really important to me that Kinsie, and my future children understand why we celebrate Easter and what the Easter bunny and Easter eggs represent. As young as she is, I made a point to read books about the story of Easter and tell her all about Jesus. Hopefully as the years go on she will learn what it means to accept Jesus into her heart too. 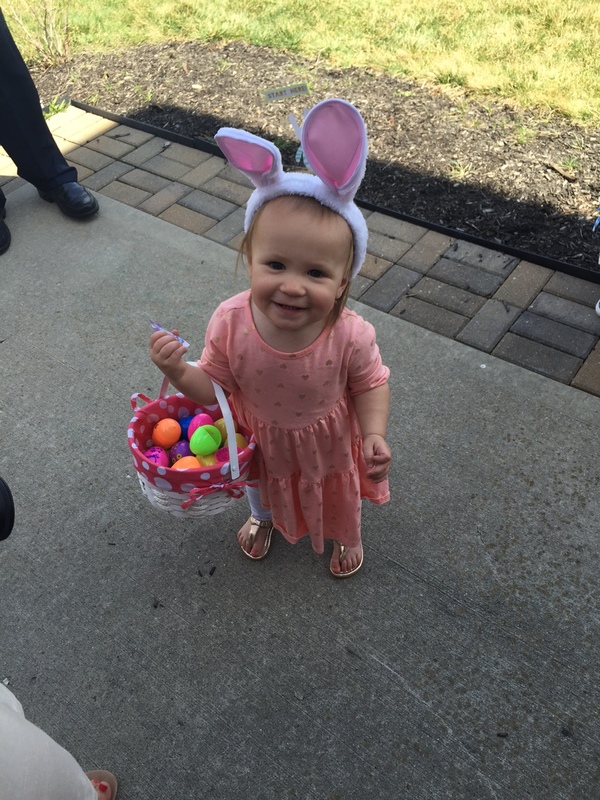 It was a busy Easter, but I was so grateful that we got to spend it with the people that we love most! As I type this, we are in the midst of yet another major snow storm. This winter has been absolutely brutal! If I didn’t have Kinsie to keep me occupied, I would probably be sinking into a black hole of seasonal depression right about now. It seems like this winter is crawling by. January seemed to be unbearably long and now we are just a few days into February. Spring is not quite in sight yet. It is this time of year where it is hard to get out of your warm bed in the morning only to drive through the darkness and trudge through the snow while the cold wind bites you in the face. Can you tell I am not a fan of winter? This winter is especially difficult when you have a baby that you have to bundle up, load in and out of the carseat, try not to slip on the ice while carrying her, and avoid letting the wind blow open the carseat cover so her sweet little face doesn’t get exposed to the harsh weather! Kinsie was born in the fall, so she hasn’t really gotten to experience nice weather yet. There were a few days after she was born that we took her on a little stroller ride around the neighborhood, but she was too little to look around and appreciate being outside. Right now, her personality is really blossoming and she is becoming so curious and interested in the world around her. With that said, I cannot wait for my little girl to experience spring and summer. 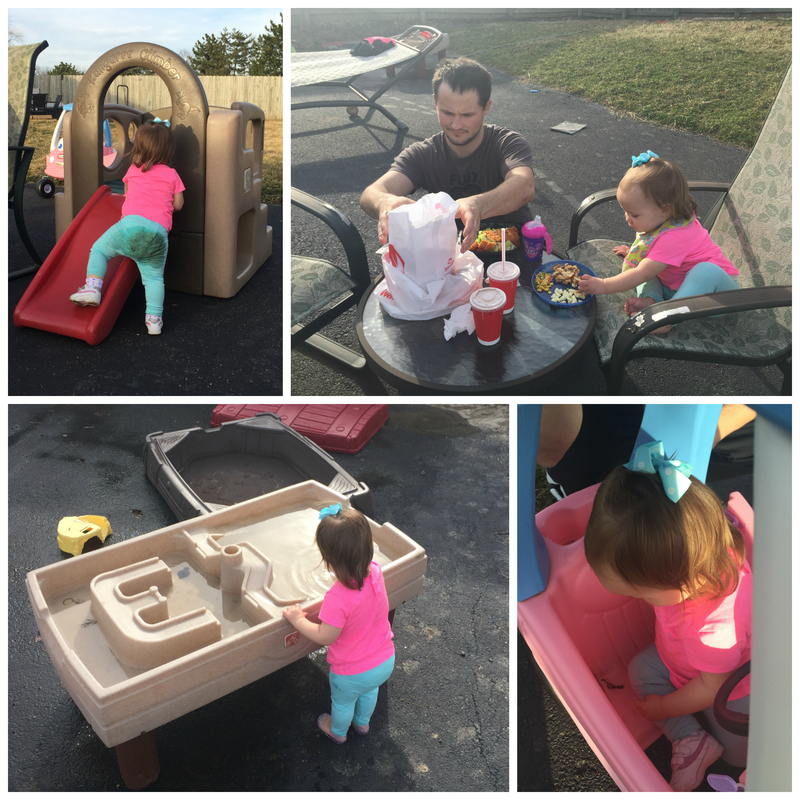 I know that she will absolutely love playing outside and enjoying the sunshine. After all, she is my daughter and nobody appreciate the warm sun more than I do! Even in these dreadful winter months, you are such a ray of sunshine in my life. Your smile shines brighter than the sun on the warmest summer day. You’ve only had a glimpse of this world and yet you are already so curious and intrigued with what it has to offer…just like your daddy. Thank you for keeping my spirits up during this harsh winter and for constantly reminding me how beautiful life can be. I can’t wait for spring to come and for you to see more of God’s beautiful creation. There is so much beauty that you haven’t gotten to experience yet and I am so excited to see the wonder in your eyes as you continue to explore the world around you. I know you will love the warm weather, the sunshine, the flowers, the trees, and all of the new life that blossoms with the spring season. Just another month or two and we can put this winter behind us and move forward into a much more enjoyable time of year! Until then, we can snuggle up and keep each other warm all day long!